Can Philips overcome our initial misgivings? An asking price of only £700 is not to be sniffed at for a 32in LCD TV from a well-known manufacturer, but is it time to smell a rat? Philips' track record with budget entry-level LCD TVs hasn't been entirely perfect, so you'd forgive us for thinking that we're going to be in for a rough picture ride from the 32PFL7562D. The 32PFL7562D's design is nothing too exceptional, and there's not a sniff of the aesthetically pleasing Ambilight feature that graces more expensive flatscreens from Philips. That said, Ambilight is something of a luxury, and its use isn't to everyone's taste. However, the 32PFL7562D's glossy black frame looks neatly positioned on its silver swivel stand, and the design and materials don't give off any bargain-basement vibes. Our first surprise from this aggressively priced LCD TV comes from its connectivity. Two HDMIs lead the charge, followed by a set of component video inputs. There is also a USB port capable of feeding JPEGs and MP3 files directly into the TV from USB storage devices, which is a pleasing multimedia touch for the money. Elsewhere, other connections worthy of note include two Scarts (one RGB), a CI slot, S-video and digital audio inputs and outputs. The lack of a dedicated PC VGA input is slightly disappointing, but computers can be hooked up using one of the HDMIs. For a £700 HDTV, the 32PFL7562D's feature count is also robust. Philips' Pixel Plus 2 HD image processing makes a welcome reappearance, which should work wonders on colours and fine detailing, as well as Digital Natural Motion processing (making movement appear smoother), noise reduction routines, colour enhancers, and Active Control, which continuously tweaks picture images. Hooking-up our Blu-ray player and setting our test movie of 300 in motion, it soon becomes obvious that the 32PFL7562D is capable of executing some great pictures. First of all, it passes the black level test with style: the darkness surrounding the harbour sequence appears to be black, without the kind of greying over that seems par for the course for many an LCD TV. Placed in the context of the price, the 32PFL7562D's black levels are more than respectable, and backed up by some immensely detailed pictures too. Hi-def pictures are also much sharper than we were expecting from this budget screen, delivered without serious dot crawl and grain. We suspect that Pixel Plus 2 HD is pulling out all the stops to get the best possible pictures on the move. Colours are also more than respectable, with our only gripe being that reds can look a little on the orange side, but it's not too profound to be distracting. Overall, the 32PFL7562D is a neat little hi-def performer, with our only real criticisms involving skin tones (a bit waxy looking), contrast levels (need to be kept low to keep video noise at bay), and standard-def footage (suffers from motion smearing). Those criticisms made, the 32PFL7562D is undeniably great value for money, the most respectable budget effort from Philips to date, and certainly strong enough to give the likes of Samsung (which has cornered the UK's budget flatscreen market) a sleepless night. 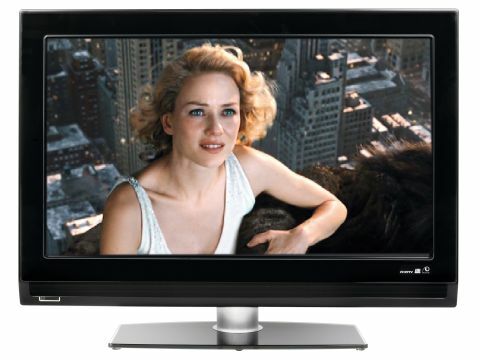 If it's solid hi-def pictures on a tight budget that you're after, then your living room has found its HDTV.